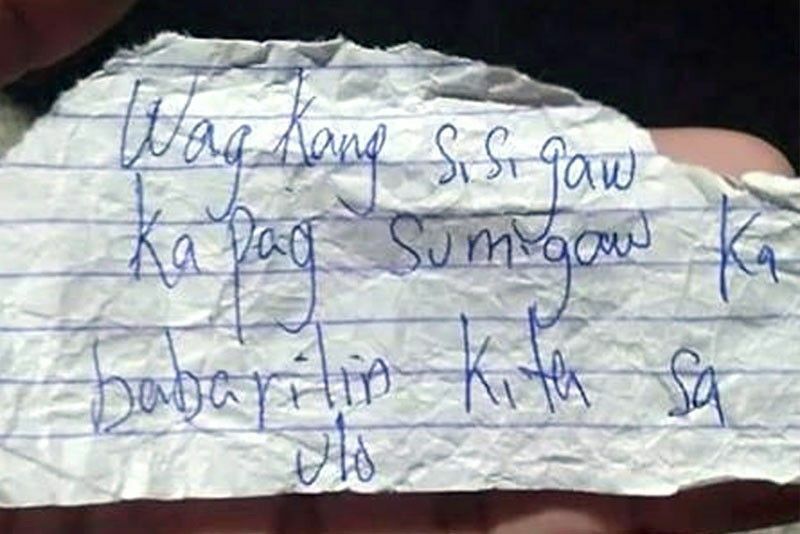 Photo shows the note written on a piece of paper that was given to Cabuang. MANILA, Philippines — A woman has allegedly escaped a kidnapping attempt by an unidentified man in Bacoor, Cavite. On her post on social media, Vallerre Jhoy Cabuang said she was walking home at past 7 p.m. in Barangay Molino 4 on Nov. 17 when a stranger called her and handed her a piece of paper. Cabuang said she initially ignored the man, but later decided to accept the piece of paper, hoping it would make him go away. But the man followed her and kept on asking whether she had read the letter. “Because there were no lights, I told him that I haven’t and continued walking,” Cabuang said in Filipino. Cabuang said she remained calm and continued walking toward a nearby gas station, while the man followed. She said the man walked away when she approached one of the gasoline attendants. They sought the help of the barangay officials, who tried but failed to find the man.